Manufactured in Hungary by Liss Patrongyarto Kft. 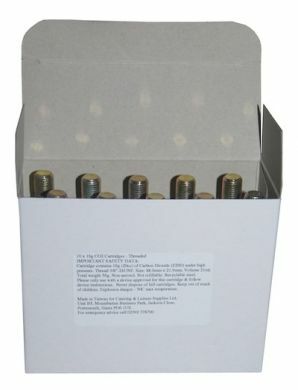 Our CO2 Cartridges are made of 100% recyclable steel, they are Zinc coated, not refillable and contain approx. 16 gms pure CO2 under pressure. Comes in unbranded plain white box. Has safety info sticker with company contact details. We stock foam covers for these cartridges which can stop your hands freezing when using with some tyre inflators - see the listing on this website.